I don’t mean to put a damper on the everyone’s summer holidays, but the current heatwaves in the U.S. and Europe has me thinking back to numerous warnings issued during last summer’s major drought and “record-breaking heatwave” in the U.S.
Analysts at Rabobank, a Netherlands-based bank specialising in food and agri-business financing, were crunching the numbers and predicted at the time that food prices, specifically meat prices, would soar in 2013 as a result of the U.S. drought. The aggregated FAO Food Price Index averaged 211.3 points in June this year, but more telling indicators might be their June 2013 Cereal Price Index, which averaged 236.5 points, and their Sugar Price Index, which averaged 242.6 points. Dairy prices are also riding above this 210 threshold, so when we consider that most people’s diets are substantially based on sugar, cereals and dairy, followed by meats from cattle raised on grains, it seems pretty clear that we’re very much in the danger zone. 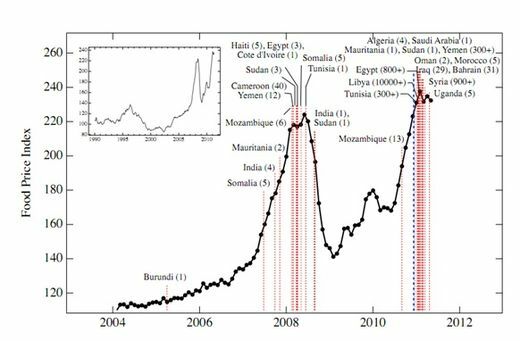 In fact, the NESCI paper, ‘The Food Crises and Political Instability in North Africa and the Middle East’, went further and forecast the highest risk of global unrest for August 2013. The Food Crises and Political Instability report doesn’t simply compile the correlation between food prices and political uprisings, but also projects a certain global threshold when food price trends might rise significantly enough to spark global unrest. According to the NECSI, the world will reach its food price threshold in August 2013. Compounded by speculators in the commodities markets “making a killing” on the food crisis, prices for staples like corn and wheat rose nearly 50% on international markets last summer. The Organisation for Economic Cooperation and Development (OECD) predicts that rising global food demand will “push up prices 10 to 40 percent over the coming decade” [that is, between 10 and 40 percent higher than their current highs]. Yes, that means there’s no room for unexpected events this year (2013). China, normally the world’s second largest surplus exporter of wheat, just this week announced that it will be importing wheat from the U.S. this year, following major crop failures resulting from the northern hemisphere’s record-breaking cold, wet spring. But the U.S. isn’t faring any better, with the 2012 drought extending into this year and condemning the growing season before it even started. Far from producing “no unexpected events”, 2013 is producing even wilder weather extremes than ever before. 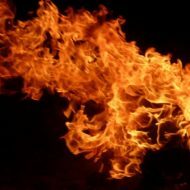 Well, the much called-for and anticipated ‘global revolution’ may be about to happen, but it looks like it’s gonna be a rather more chaotic and misguided affair than many have hoped for. Buckle up indeed,and better get canning!